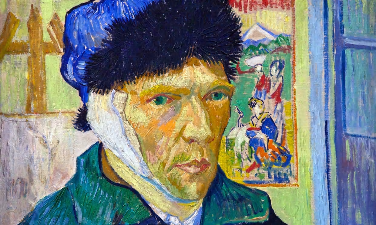 This picture – “Self-portrait with Bandaged Ear” – was painted by van Gogh in 1889, using oil on canvas, shortly after he returned home from hospital having mutilated his own ear. It shows the artist in three-quarter profile standing in a room in the Yellow House (just outside the old town walls of Arles in the South of France). It shows his right ear as bandaged, but it was in fact his left ear that was bandaged, the painting being a mirror image. Although for a short time van Gogh did get to carry on living in the Yellow House, within a few weeks, acting on a petition handed in to the local authorities and signed by 30 of his neighbours, he was forcefully removed and taken to Arles Hospital where he was locked in an isolation cell. In May van Gogh committed himself to the private asylum in Saint-Remy a small town north of Arles and in a little over a year he was dead. You can read more about this painting and see a larger version of it both here and here.